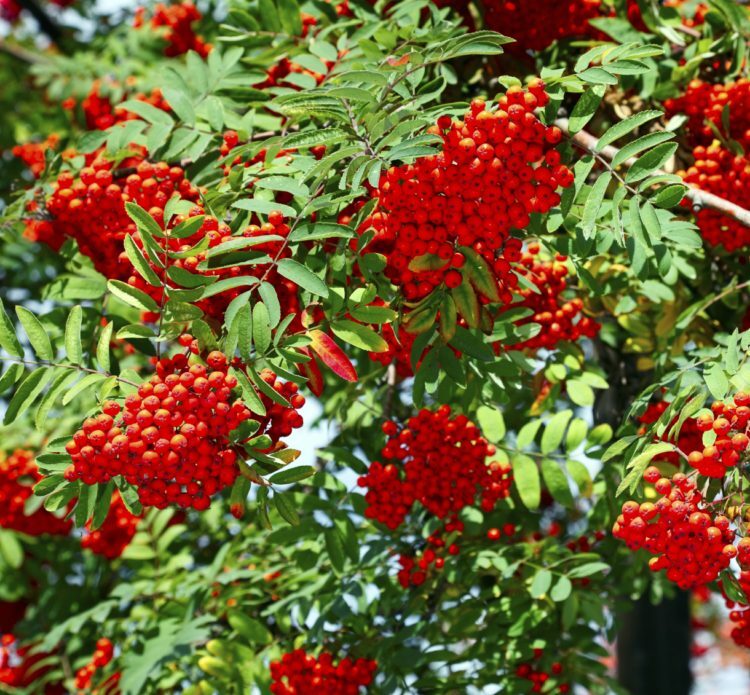 These Ornamental varieties of the Mountain Ash or Rowan are well mannered Ornamental trees grown mainly for their colourful berries, also for the flower clusters in Spring and their vibrant autumn leaf colour. Mountain Ash also called Rowans or Sorbus are native to the cooler more temperate areas of the Northern Hemisphere with some varieties found as far as western China. The ornamental varieties of Mountain Ash are small, neat, deciduous trees best known for the beauty of their colourful berries and foliage in autumn ranging from oranges, reds, purples and yellows of the foliage to whites, reds, yellows and pinks for the berries. Apart from their ornamental value many gardeners grow them to attract wildlife especially birds for the berries, although of course earlier in the year in spring the white or pink blossoms are a magnet for bees and other insects. There are numerous ornamental varieties of Rowan, a few of the most popular being the Mountain Ash Embley which is an exceptionally small tree brilliant for restricted spaces or woodland gardens, with glowing red autumn foliage and orange-red fruits. Mountain Ash Joseph Rock is another which grows to about 10 metres with feathery green leaves turning through shades of red, orange, copper and purple in autumn, hence the name, the berries of this variety appearing as creamy-white in colour before turning to deep amber yellow in autumn and persisting long after the leaves have fallen. Another superbly attractive Mountain Ash is the Pink Pagoda which is a small vigorous variety with unusual grey green pinnate leaves which turn to varying shades of orange and red and large clusters of pretty pink tinged flowers appearing in spring followed by large bunches of persistent and very colourful pink berries. All these species are easy to grow in most soils and situations and make for wonderful colour in the garden throughout the year.